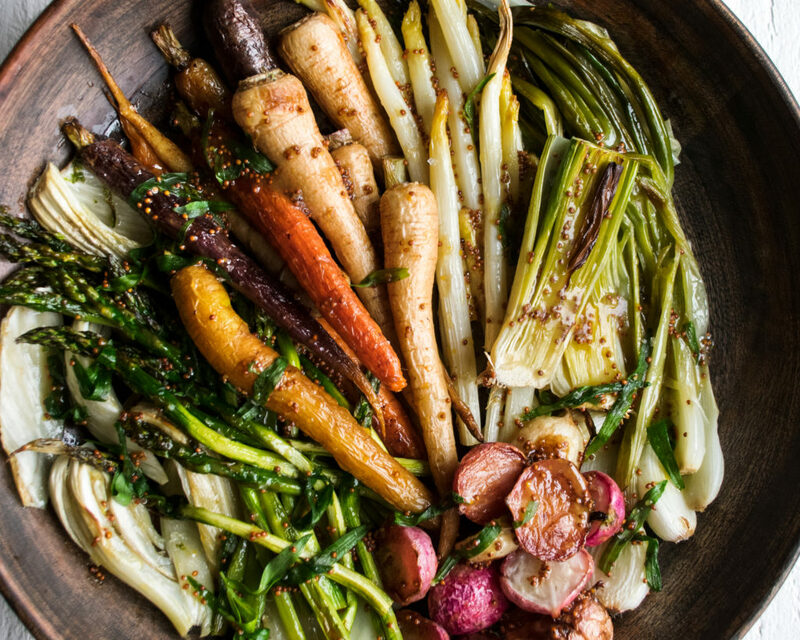 The most beautiful platter of roasted spring vegetables with a sweet & tangy tarragon mustard vinaigrette. It’s simple, effortless, and the perfect recipe for entertaining! With Easter quickly approaching, and Mother’s Day shortly after, I am in full spring entertaining mode! Yesterday I shared these lamb chops and the day before this decadent salted chocolate coconut tart, with a lot more new recipes coming to you this week. Something about the warming weather, sunny skies, fresh blooming flowers, and vibrant produce has been keeping me extra excited in the kitchen. Everything is a bit more colorful, and tasting extra good. 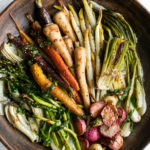 And these roasted spring vegetables are no exception. My roasting method is pretty simple, and I typically like to stick to it no matter what vegetable I’m roasting – lots of olive oil, a generous seasoning of salt, 425F for *as long as the vegetable needs*. All ovens are different, so cooking times will sometimes vary. On a regular basis I actually cook in two different ovens, and one is so much stronger than the other, so all of my cooking times are cut down when using that oven. Vegetables themselves cook at different rates, too, so you’ll want to start some before the others (for example, bulky carrots will take longer to cook than thin asparagus). I recommend to follow my base amount of time in the recipe below, but use your best judgement when things are done. For these vegetables, you’re looking for them to be tender, but still have a bite to them. They should be caramelized and slightly browned, but still have bright beautiful color to them as well. 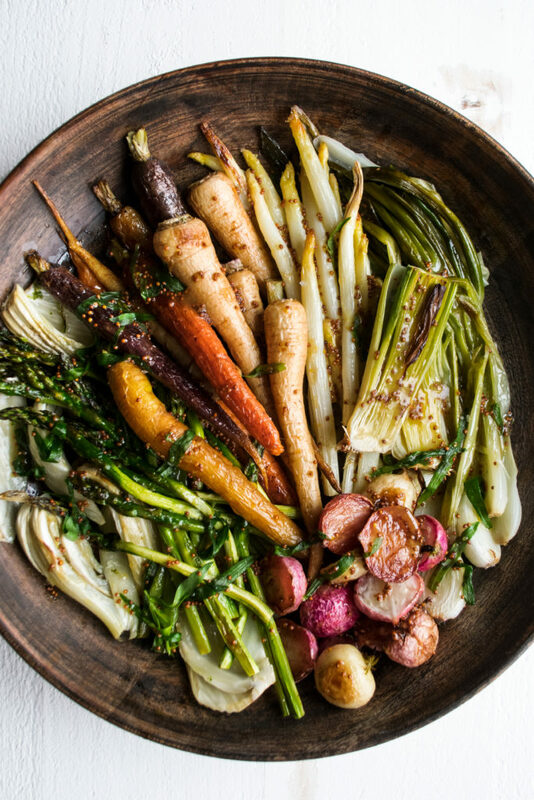 Once the vegetables are prepped and roasted, it’s simply a matter of spooning the tangy, delicious tarragon mustard vinaigrette over top. When the vegetables are warm, they’ll sort of soak in the flavorful dressing and become infused with flavor. This is such an easy dish for entertaining that I just love because it creates the most beautiful presentation on a spring table. I hope you enjoy! Whisk the grainy mustard, honey, and white wine vinegar together in a bowl. Slowly drizzle in both oils, whisking continuously until emulsified. Stir in the tarragon leaves. Season with salt to taste. Preheat the oven to 425°F. Prepare the vegetables as directed in the ingredients section (the blog text provides a visual of how each vegetable should look once prepped). 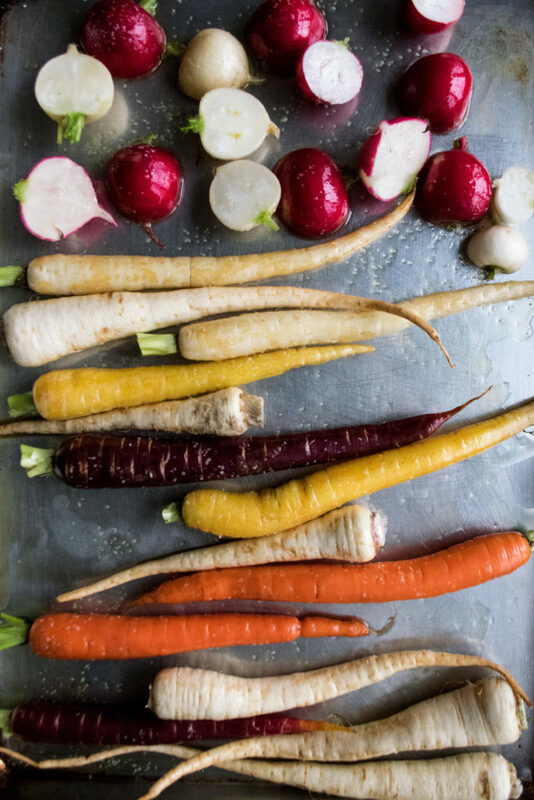 Arrange the carrots, parsley root, and radishes onto a sheet pan in an even layer. 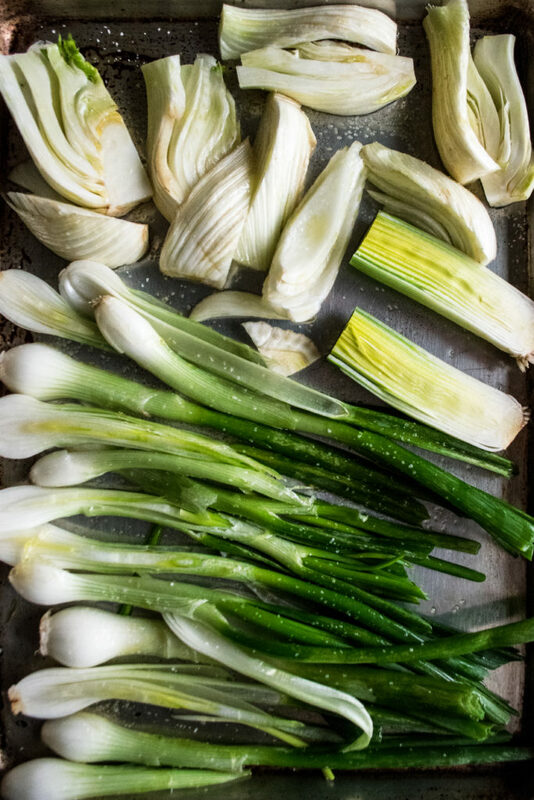 Arrange the leeks, spring onions, and fennel onto another sheet pan. 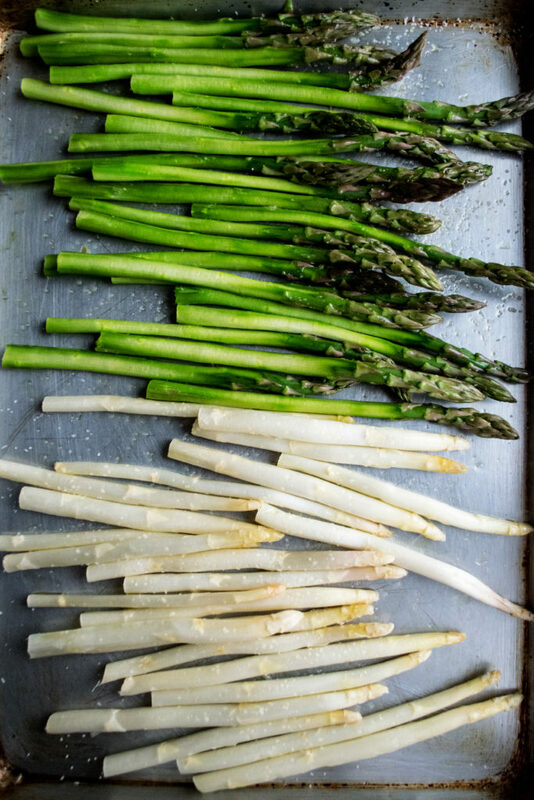 Arrange the green and white asparagus onto another. 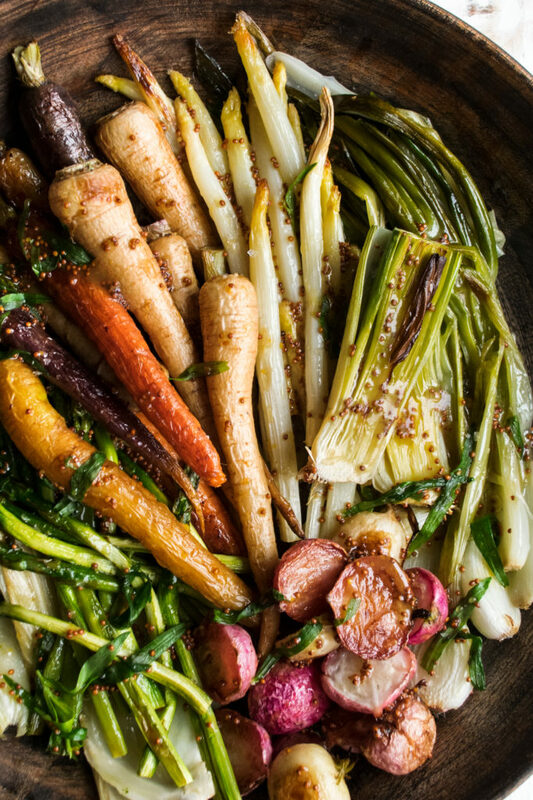 Coat all of the vegetables with a good drizzle of olive oil and generous seasoning of salt. Place the carrot pan into the oven first. Roast for 10 minutes before placing the leek pan into the oven next. Roast for 5 more minutes before placing the asparagus pan into the oven. Roast for another 10 minutes. All of the vegetables should come out at the same time. Note: All ovens are different. Start with these times and adjust as needed. The goal is tender, vibrant, caramelized vegetables. Arrange the vegetables onto a serving platter. Spoon the tarragon mustard vinaigrette over top. You can easily omit one of the vegetables or really use any combination that you’d like!